On Wings of Eagles: Does the world see God's light shining through you? Does the world see God's light shining through you? "Why go out tonight? There won't be a soul there." As the minister watched the rain lash against the window, the voice that spoke inside him sounded reasonable enough. It was one of the stormiest nights of the winter. But somehow he felt he must conduct that evening service. So he put on his raincoat, took his lantern, and stepped out into the blackness. The water almost blinded him as he plunged into the teeth of the gale. On and up he plodded until he came to his church, which stood on a high hill along the Scottish coast. When he had opened the door, he set the lantern on a window sill, and then sat down to wait for his congregation--a congregation that never came. At last, seeing he would be quite alone, he sang a hymn and knelt and prayed. Then, his duty performed, he locked the church and went down the hill. Had it all been a waste of time? The pastor wondered. But the next morning he heard a different story. The night before, when the storm was at its worst, a fishing vessel had been trying to make the harbor. The skipper was floundering around in the blackness until he saw the small light in the old church. Without that lantern the ship would have surely been carried onto the rocks. But thanks to those steady beams, the pilot had brought his boat safely to port. It was a lesson to the minister. After that, he knew that any light he might throw into this world's darkness would never be entirely lost. 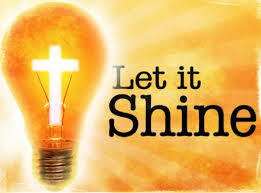 Are you letting your light shine for God today? Dear Lord, we pray today that we would let Your light shine though us no matter the circumstance. In Jesus’ Name, Amen.